As many of you know, we've been hearing snippets of news about the new audio drama series called The Extraordinary Adventures of G.A. Henty. We've shared bits and pieces over the past months, but now the wait is finally over. 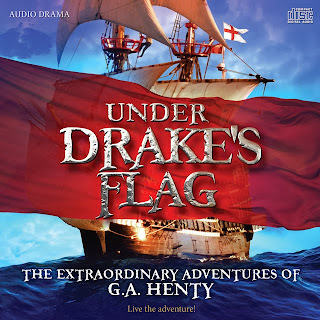 The first production in the series, Under Drake’s Flag, is available in both mp3 and CD formats today at HentyAlive.com! Under Drake’s Flag is a 2-hour dramatic audio adaptation of the book of the same title by G.A. Henty. It chronicles the journey of two young boys, Ned and Gerald, as they traverse the globe on board a ship under the command of Sir Francis Drake. During their adventures they face sea battles, shipwrecks, and the Spanish Inquisition among many other challenges. They also find friends in the unlikeliest of places, among escaped African slaves, on a Spanish controlled plantation and in a prison. Amidst all the trials, the boys learn the value of being a man of integrity, the importance of friendship and how to trust God even in the darkest of circumstances. As an avid listener of audio drama for over 20 years and a critical reviewer for the past three, I have heard productions that are great and some that are subpar. Under Drake’s Flag is easily among the best I have ever heard. This production is simply awesome; top-notch in every aspect. It’s full of action, adventure, drama and even romance while also driving home some powerful morals of honor, chivalry and reliance on God. It has all the elements of a fantastic story, but it is also filled with valuable life lessons. Writer John Fornof did a fantastic job of adapting this piece of literature into a captivating screenplay for the mind. The character development is excellent, making each role very believable and the listener can almost picture himself in the situations in which the main characters find themselves. This is also a result of the superb acting which, aside from the script itself, is probably the most important component of the production. The actor’s portrayal of these characters is done so well that you feel almost as if you know them. The sound design is absolutely stunning! Even though many of the scenes are quite difficult from a sound perspective, Mark Drury and Rob Jorgensen do a masterful job of bringing them to life with outstanding realism. As odd as it may sound, many times the best sound design in a production is the kind that is not immediately noticeable. When the sound is up front and center stage it can detract from the story, but when it is done well it doesn't always stand out because it is so tightly integrated into the production as a whole. Such is the case with Under Drake’s Flag. The same is true for the music and John Campbell has once again composed a soundtrack that is truly beautiful. Every piece, from scene transitions to the theme music, is crafted in such a way that it draws the listener into the story and keeps them there. 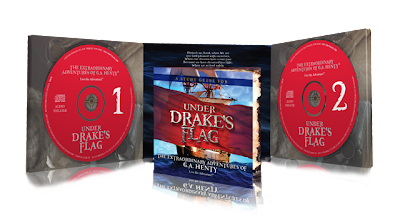 Under Drake’s Flag is a must for all audio drama fans as well as the perfect introduction to those who have yet to explore the medium. With a story that encompasses multiple genres it holds broad appeal for folks of all ages. I’m thoroughly excited about The Extraordinary Adventures of G.A. Henty series and I can’t wait to hear what comes next! If you’d like to get a copy of this amazing audio drama, simply go to HentyAlive.com and order today. For a limited time, you can also hear a portion of the drama for FREE to see if it’s something you’ll enjoy. (Take it from me; you’re going to love it.) The team is also offering many other products related to this story so check it all out at HentyAlive.com. And be sure to let me know what you think of the drama in the comments below.